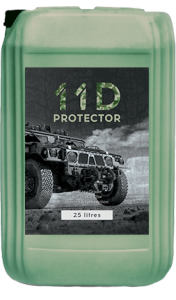 Currently being used on NATO mission, 11D Protector is the most powerful product in the 11D product range. Designed to protect any wheeled military vehicle against unwanted downtime that is not only costly, but can be dangerous. 11D Protector is an 11D custom made product which performs at the maximal technical capabilities that any tyre sealant can offer. 11D Protector is rich in fibers and offers an unparralled sealing ability, to ensure the safety when it matters most. 11D Protector is available under standard NATO ordering procedures and has been tested both domestically and abroad. 11D Protector is currently used during the Multidimensional Integrated Stabilization Mission (MINUSMA) in Mali, Africa. 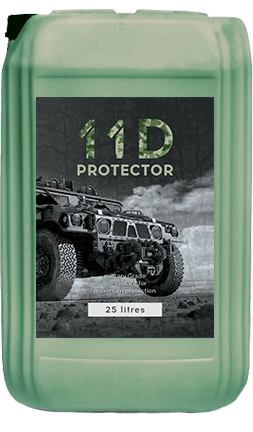 11D Protector not only improves but also ensures the operability of any wheeled military vehicle. When operating in a hazourdous environment, vehicle downtime not only harms the efficiency of the operation – but also causes a dangerous situation for its operators. 11D Protector is easy to apply and remove, and is available with custom labeling to ensure safe installation. Maximum performance in both extreme cold and heat, 11D Protector provides security when needed most. Custom made to match the viscosity requirements of any wheeled vehicle, 11D Protector is a valuable safety measure which can be used in ATV’s, Multi Role Jeeps, Trucks, Bulldozers, Personel Carriers and Armored Vehicles of any kind. 11D Protector is a toxic free and non flammable product, which allows safe application and use. Labeled as non dangerous air cargo, 11D Protector is safe to transport.